Just something I brainstormed on a whim. This is my first post here, so don't expect this to be the best idea you've read all day (or for it to even be decent in the first place). Sounds good to me, but I'm just me, so... yeah. A new type of crop that is planted in dirt (no tilling required) submerged one block underwater (water source block). This provides a semi-realistic rice farm setting. Fully grown, rice crops are about one block higher than the water. When harvested, the rice acts as both the crafting material and the seed, producing more than originally planted for a net gain like other crops. The player can hide from Phantoms in the crops, the mobs not willing to get all wet and tangled in the moist plants. Courtesy of ScotsMiser - The crops also serve as a defense against Drowned Zombies in shallow water. The mobs have trouble moving through them, and any tridents thrown are also tangled in the plants and stopped. Straight from the farm to your bowl; a nice helping of nutritious rice. Restores 5 hunger points with roughly 6.5 saturation, placing it somewhere between beetroot soup and bread in terms of nourishment. Tired of dried kelp and tropical fish being bite-sized novelties for a couple of achievements? Enter rice, a saving grace for these otherwise superfluous items. Roll that colorful fish in some dried kelp, roll that in rice, and voila! A classic Japanese delicacy. Creates 3 items worth of sushi. Each one restores 3 hunger points with roughly 4 saturation. While there isn't much of a net gain in hunger points, the net gain in saturation easily makes up for this. Steering away from food items, the Rice Block would have a very interesting function. Being highly absorbent, the block expands into more blocks of varying moisture levels when in contact with water until it reaches a maximum capacity (total number of blocks is entirely up for discussion). If the expanding rice blocks are in a confined space with no openings, this expansion is strong enough to push blocks like pistons (limited by a certain number of block layers), growing through and around new openings. Although it doesn't drain an area of water like a sponge, the expanding cloud of wet starch would be a very interesting mechanic. All expanded rice blocks are affected by gravity. Destroying the expanded rice blocks allows the player to retrieve an amount of rice proportional to the original number of rice blocks used. I figured a completely new crop would need some variety behind it to justify its inclusion. Given its unique planting requirements, I figure it would make shallow swamp ponds very appealing locations for growing large quantities. What else could be done with this? Discuss, critique, anything. Sounds cool! I mean who doesn't want to eat Sushi on Minecraft haha. Oops... 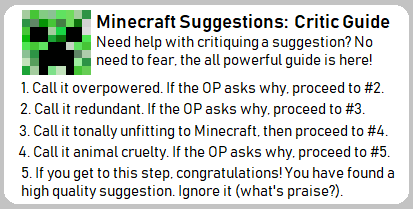 I meant to post this in the overall Minecraft suggestion forum instead of the Java Edition forum. Any chance a mod could move it, or does it really matter? Firstly, congratulations on including far more detail than is typical for new food suggestions. Huzzah! The general problem with new food suggestions is that there are already quite a variety of foodstuffs in the game and some of these see very little use. Adding new items that are functionally identical (or nearly so) to extant items provides a poor return on resources. A nice job has been done with making the growth conditions both different from any extant MC crop/plant and reasonable accurate to the IRL version of the addition. The return when harvesting is not stated, but using the wheat model seems reasonable ie. "from 0 to 3 seeds per crop harvested (about 1 5⁄7 seeds/crop harvested on average)". Some further differentiation may, however be desirable; having rice grow only in moonlight (ie. the growth rate would be affected by the moon phase) could be used to sufficiently distance the MC plant from its IRL eponym that its properties could be freely manipulated. The other main product of IRL rice farming is rice straw; this ought not be treated as a hay equivalent (both as a matter of logic, and to avoid excessive substitutabiliy). Looking through various IRL uses for various straws ( https://en.wikipedia.org/wiki/Straw ) the uses as a construction material (either strawblocks or as a way of toughening bricks/concrete) would seem to require the least work to add to the game. Thatch is another obvious use, but the flamability would make it useful only for decorative or creative mode builds outside of the few biomes 'naturally' free from lightning. I like what you've done with the rice plant, but don't see sufficient utility to the foods to justify adding them. Adding some non-food functionality to the rice fields (and/or the products) so that the foods additions become merely logical sidebars rather than the main point seems easier to justify. All of the non-food uses you mention sound excellent to me. Another possibility could be that it deters phantoms. Trying to dive into them would result in some very soggy and tangled wings. And holy crap, I just want a better defense against these things. They're horrifying. Rice is also very absorbent when dried. We already have sponges, so that function is out of the question, but there might be some use in the way it expands as it absorbs water. Maybe it could be crafted into a block that, when placed in water, expands into more blocks of varying moisture until they reach a maximum. Not sure what it would be useful for, but it would certainly be interesting. EDIT: I'm updating the original post as we go. I'd rather fix MobB (eg one proposal). Growing 'pots' of rice (water source in floating cage) in an array might be helpful meantime however. Given the historical use of dry wood pegs that swelled when wetted to quarry stone, using dried rice blocks as an omnidirectional piston equivalent with a lower (3?) block push limit doesn't seem too much of a stretch [particularly to Hornblower fans]. The lower push limit, need to apply water, (and requiring that the blocks be dried before reuse, as are sponges) ought keep these from supplanting pistons. Still editing as I go. What if the rice blocks were affected by gravity? It would make some interesting traps. Death by rice. Better yet, what if you could feed it to chickens? It would eventually make them explode, but they charge towards Creepers before exploding, acting as the ultimate revenge against them. Sounds a bit silly, but I dunno. I really like the idea of more eastern themed items, however, I have to ask how would this enhance the game in any way? It feels to me like yet another food item, and I don't think we need more food. Is this really worthy of adding? I understand it is different but it does not seem all that intriguing. Just because the food is gathered differently does not warrant its addition. Why though? Why is do Phantoms not see through rice? This all seems very random. Please explain. If you simply mean adding new blocks... well that could be said for almost every suggestion. Yes, and all sushi is is yet another food item, which I would argue is irrelevant when we have bread and meat. The Phantoms would get their wings tangled in the tall and soggy plants. They would also block Drowned Zombies and the tridents they would throw. It's all about the consistency of the plants. Rice was a good way to include the expanding block mechanic. The block idea by itself seems odd, but in context with the other items, it's a fitting addition. Each item ties back to rice as a crop, so like ScotsMiser said, food items are more of a side addition. Also, it would be nice to finally have a practical use for dried kelp and tropical fish, two existing food items that, by themselves, are far more superfluous than sushi would be. The problem with adding food from another country is that every other country will want to add their food in. And we really don't need another food item in the game. C1ff's idea of nutrient subcategories (different thread) actually seems promising. As long as it isn't "required" (just providing some small perks and the like), it's exactly what the game needs where food variety is concerned. New crops would be great! I really like making farms of different fruits and vegetables when playing, especially with mods like Pam's Harvest Craft. Only thing I'd say is, if they add things from eastern cultures, they'd have to add things from southern cultures, south-eastern cultures, western culture, south-western cultures, etc... If they add rice as a crop they have to add different things to appeal to a wide variety of audiences, and not try to shift towards one type of play style or one type of race. This is true, and with all of the biomes available, there's plenty of room for a lot of different cultural culinary delights. Protein - Boosts healing and long-term use of tools. Carbs - Boosts short-term use of tools. Fats - Boosts intermediate-term use of tools. Vitamins - Boosts resistance to poison and other ailments and also increases iron bonuses. Minerals - Boosts resistance to direct damage. Iron - Increases sprinting speed and other cardio-heavy actions. Fiber - Increases bonuses of other nutrients. Caffeine - Camouflages player from Phantoms and increases overall speed, but increases hunger. There are no penalties for a lack of variety in the player's diet (so as not to overcomplicate the game), but taking advantage of these bonuses would always be a good idea. All thee foods in MC rn come from a country. People in Sweden eat bread, people in America eat bread, People in Mexico eat bread, etc. However, since the food is super broad, it doesn't appear to come from one specific country. Rice and all of the other of the OP's suggestion seem to be broad enough to not be specific to a certain country/culture.